Click here for an abbreviated syllabus on the official school letterhead. Reasoning based on probability and statistics gives modern society the ability to cope with uncertainty. It deals with the design of how data is collection, the analysis of the data, and the drawing of conclusions from the data. Statistics has astonishing power to improve decision-making accuracy and test new ideas. It's a key analytical tool used in education, the social sciences, and business administration and is often a required college subject for majors in those areas. Statistics is frequently used for data analysis in the sciences and forms the mathematical basis for quality control in manufacturing. AP Statistics is a college level class for students who have been highly successful in Algebra II. 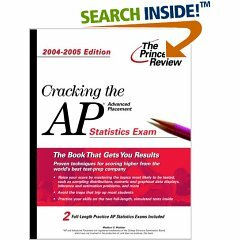 It covers the topics needed for the American College Board AP Statistics exam. Students passing this test may receive college credit. In college, statistics is generally considered an intellectually challenging course. Correlations between the combined PSAT math and verbal scores with the passing rate in AP Statistics bears this out. However, AP Statistics has an advantage over the equivalent college course in that it takes an entire year to present what would be considered a semester of material in college. TI-83 Calculator: virtually every traditional calculation will also be done on a TI-83 . Excel Spreadsheet Software: has become ubiquitous and so students will learn how to insert functions and write formulas in it. These will be used for simulations and regression analysis. Minitab Statistics Software: a popular statistics software with more statistics features than Excel. Students will use Minitab for tasks such as regression analysis, chi squared tests, and parallel box plots. Fathom Software:: will be used by the teacher for demonstrating the basis behind several of the statistics techniques such as regression and correlation. Amazing Applications of Probability and Statistics: Mr. Rogers has provided a series of online articles at http://www.intuitor.com/statistics/ both for your enrichment and use in class. These contain a number of applets supported in part by Clemson University and the National Science Foundation. Syllabus and Unit Plans: a copy of this syllabus with links to a complete set of unit plans including home work assignments and practice tests can be found at http://www.intuitor.com/student/AP_Stats_Syl.php . A USB thumb drive or other storage media for backing up spread sheet programs. A TI-83 graphing calculator. Other calculators can be used, however, the TI-83 is specifically designed for statistics and will be the only calculator covered in class. A set of dry erase markers. You will frequently be working problems at the front of class on a white board. A package of 3x5 cards: Starting immediately, each student will, over the course of the year create a set of statistics flash cards to use as a study aid. Barron's Ap Statistics : with CD-ROM * by Martin Sternstein, available from Amazon.com (follow the link) or through local book stores. To maximize you grade you will have to begin studying from this book no later than Dec. Note: The Barron's AP Statistics book does not change much from year to year. The exact publication year does not make a lot of difference, however, given a choice buy the most recent one, especially the one with the CD-ROM. (For details see Mr. Rogers' Syllabus - Information Common to All Classes.) Tests will be the single largest item and will be written as close to AP exam standards as possible. The good news: practice tests for most units are available online. The link is at the top of each unit plan. Additional grades will come from the Statistics Investigations and Enrichment Activity as shown below. Course work will generally be finished by sometime in March leaving the rest of the year for review and special projects. The first semester exam will be taken directly from old AP tests or AP study books and is often an indication of success on the AP exam. To maximize your grade, you will have to begin using the Barron's AP test study book (see Materials for Class) no later than December. The fourth quarter grade will consist primarily of practice AP test grades. Generally, there is a high correlation between these practice exams and your grade on the AP test. You will be performing statistical analysis of various types both as an individual and as a member of a team on almost a daily basis. At times you will be asked to work on the white board at the front of the room. Your active participation will be required. Statistics is about collecting and evaluating data in order to draw conclusions, so students will perform a number of statistics investigations similar to those performed in science classes. We will also be performing a number of simulations to help us verify theory as well as understand the use of and limitations on many of our statistical techniques. Each student will turn in a Word or Excel File for each investigation. These are to be turned in and kept in the Statistics Investigations folder of your student Home Directory. Complete specifications on the format for the investigations can be found here. Each student is to Review the statistical analysis in an article published in an academic, technical, or scientific journal once in both the 3rd and 4th quarters in order to see how "the professionals" use statistics (professionals being a very loose term). Popular magazines are not allowed. The paper reviewed must be at least 3 pages long. The write up should be four concise paragraphs. The first should summarize the article's content (what the article is about). The 2nd briefly review how the article designed its data collection methods. The 3rd how it analyzed its data, and the 4th whether the conclusions drawn were statistically defensible. It�s only necessary to choose one item or aspect from the article and briefly discuss the design, analysis, and conclusions relative to it. Be concise! All reviews are to be typewritten and have a photocopy of the first page of the article and subsequent pages with relevant statistics. Reviews should be less than 2 pages in length. A given article can be reviewed by only one person. Students should sign up in advance for the article they want to review. All reviews are due one week before the end of the quarter. The Exam will be given on Friday, May 9, 2014 at 12:00 pm. You must arrive 30 minutes early. The three-hour test includes a 90-minute multiple-choice section and a 90-minute free-response section. You'll need to bring a graphing calculator with statistical capabilities to the exam. AP tests are graded on a scale of 1 to 5 with 3 considered passing. Who Should Take This Class: Students with an interest in careers related to: medicine, bioinformatics, genetics, business, mathematics, architecture, engineering, any of the sciences, or the social sciences including psychology, sociology, political science, and education. In college, statistics is required for most majors with the possible exception of the fine arts..
Summer Assignment: Students who will be taking AP Statistics in the fall should read and familiarize themselves with the online articles at Amazing Applications of Probability and Statistics . Prerequisites: Algebra II Honors or Algebra II with teacher recommendation. A combined PSAT verbal and math score of 111 or higher is a good indication that you have the background needed to succeed in the course. Surprisingly, a score of 3 or higher on the AP World History exam is also a strong indication of future success in AP Statistics. Tool Safety Rules: Details rules for the safe use of the tools and devices found in room 134. Medical Incident Procedures: Details procedures to be followed in a medical incident such as fainting, allergic reaction, sudden illness, injury, etc. The following is offered as a general indication of how the class will be paced. Adjustments will be made as needed. * Note: Mr. Rogers does receive a small commission from books ordered using the links on this page. This helps cover the personal funds he spends on his classes. AP statistics students can generally not receive extra credit except by entering a statistics related project in the 3rd quarter. This can earn as much as the equivalent of 10 points added to the lowest 3rd quarter test grade. Typically , the science fair idea is due by Nov. 1st, the experimental work is to be completed by January 31st, and the total project completed by February 10th. Last minute projects or poorly done will not be accepted. Insultingly Stupid Movie Physics is one of the most humorous, entertaining, and readable physics books available, yet is filled with all kinds of useful content and clear explanations for high school, 1st semester college physics students, and film buffs. It explains all 3 of Newton's laws, the 1st and 2nd laws of thermodynamics, momentum, energy, gravity, circular motion and a host of other topics all through the lens of Hollywood movies using Star Trek and numerous other films. If you want to learn how to think physics and have a lot of fun in the process, this is the book for you! Copyright � 1996-2011 T. K. Rogers, all rights reserved. Forchess � is a registered trademark of T. K. Rogers. No part of this website may be reproduced in any form, electronic or otherwise, without express written approval.